Scotland’s golf coast is one of the gems of East Lothian and action for Scotland’s national business golf tournament got underway yesterday at the stunning Craigielaw Golf Club with players gathering in the new clubhouse which offers panoramic views over the Firth of Forth towards Fife. 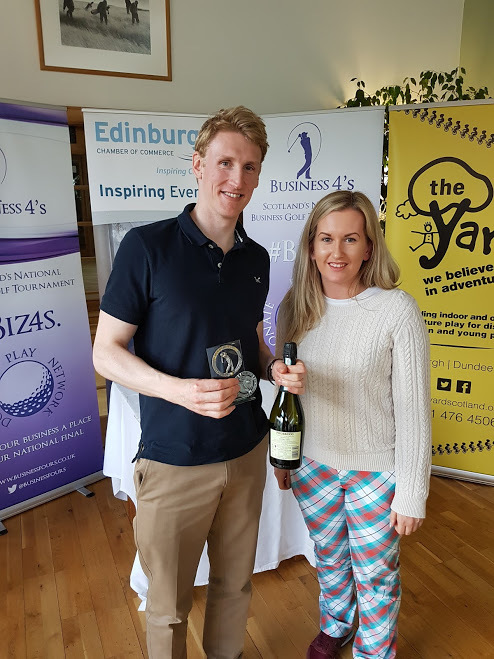 The Professional Services heat of the tournament was supported by the Edinburgh Chamber of Commerce with Emma Reid and Alice Beeby in attendance on the day. They got into the spirit of the day by donning some traditional golf gear – a pair of Royal & Awesome tartan troos. The competition itself was played in a friendly spirit with all the teams enjoying the day in a relaxed atmosphere. In what was the inaugural Business Fours tournament, professional firms took part from a range of sectors including banking, represented by companies such as RBS and Hampden & Co, and law firms being represented by Turcan Connell and Anderson Strathern. The format of the tournament aims to integrate professionals together with a unique networking formula. In an intimate and exclusive setting teams came with the view to meeting like-minded professionals in a relaxed environment. The Yard Scotland, charity partners for the Links season of Business Fives was a partnership born from the Edinburgh Chamber of Commerce networking events and served as a great platform for the adventure play centre for children with complex needs to raise their profile. Business Fours has made a company commitment to donating 10% of proceeds to charity and for the West of Scotland, Beatson Cancer Charity has been selected as the charity partner. Play got underway with blue skies which finally give way to greyer clouds around the turn. With the Craigielaw course in brilliant condition for this time of year, play continued uninterrupted (even if the scorecards did take a beating on the back nine). The format for the day was a stableford competition with a few individual prizes up for grabs. 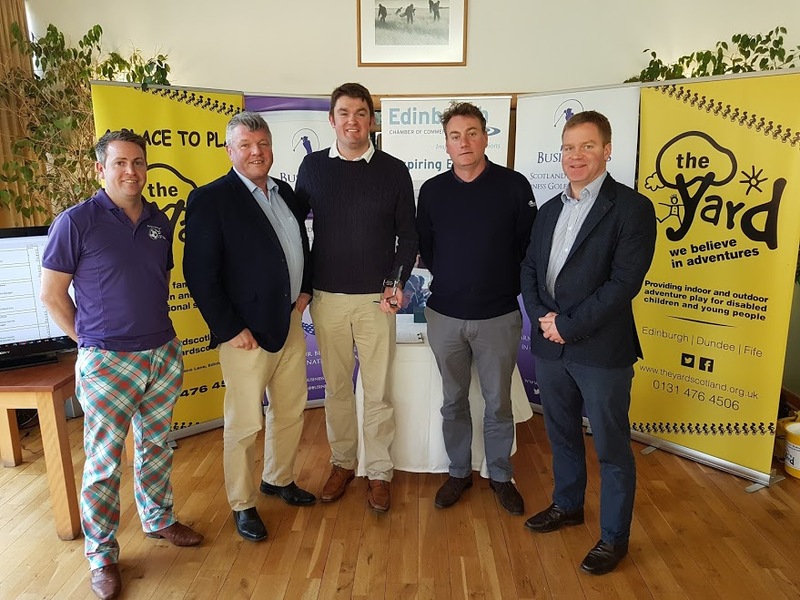 The main twist on the course was the addition of the yellow ball that reflected the distinctive branding of charity partner, the Yard Scotland, with four double scoring points on the course, provided players didn’t lose their balls. Brewin Dolphin Director Johnny McGlynn’s long putt on the 18th was enough to see him lift the accolade for the Longest Putt competition. Another winner from Brewin Dolphin, Assistant Director Ross MacNish saw his booming drive land beyond the fairway and on the green of the 393 yard, par-4 5th hole. Even downwind this was a massive drive and thankfully he did manage to walk off with a birdie. Business Development Manager Murdo McHardy from Scotland’s newest bank, Hampden & Co, beat off stiff competition to get within Andrew Ross from Turcan Connell’s fine approach to the par-3 17th hole to claim the Nearest the Pin prize. Anderson Strathern’s Robin Turnbull hit a brilliant shot into the 3rd hole to get within Frank Hoskins of Hampden & Co to stop the banks clean sweep of the Nearest the Pin trophies. To encourage integration and networking individuals from each company were paired off with players from other teams to spark off relationships with the common ground of golf. For the purposes of qualifying for the national final, companies were scoring alongside their colleagues with the four scores from each team combining to determine the eventual overall winners. The Edinburgh Airport team were one of the eventual qualifiers helped largely by three stableford scores in the high 30’s from Bryan Weir, Gregor Fraser and Nick Gilmore. For law firm Anderson Strathern it was two particularly good scores from Daniel Ferguson and Robin Turnbull that helped them qualify for the national final and maintain a proud history in the Business Fives family of events by reaching every final so far across football and golf. There was steady scoring from all four members of the Turcan Connell team that saw them qualify, with Andrew Ross, Scott Hunter, Callum Townsend and Gareth Hall all scoring in the 30’s. Brewin Dolphin’s team emerged as the eventual winners thanks to a team effort from the quartet of wealth managers. As winners, they will wear their Royal & Awesome trousers with pride come finals day on 24th May at St Andrews Fairmont. Importantly, it was the Yard Scotland who went away with the generous charitable donations for the charity raffle, won by Jamie Boyd which was probably a fair reward for the 40 points he scored on the course. He won a fourball at Trump Turnberry, which was kindly donated by the course. With three more qualifying heats to come, the action concludes at St Andrews Fairmont on May 24th with the national final to determine Scotland’s national business golf champions 2017.